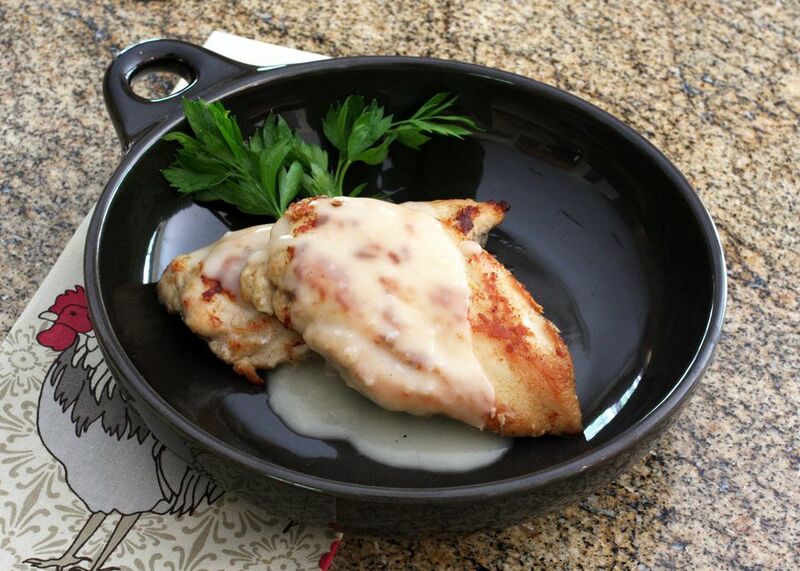 This simple skillet chicken is perfect for any night of the week, and the veloute sauce makes a wonderful gravy. Use a good quality chicken stock to make the sauce, then serve with mashed potatoes or rice for a fast and easy, great-tasting meal. This is a recipe you'll reach for again and again. Put chicken breasts between sheets of plastic wrap and pound to an even 1/2-inch thickness. In a large skillet, melt 1 tablespoon of butter with the olive oil. In a plate or shallow bowl, combine the flour, thyme, 3/4 teaspoon salt, 1/4 teaspoon black pepper, and a dash of garlic powder. Stir to blend thoroughly. Dredge the chicken pieces in the flour mixture, coating well, then fry for about 4 to 5 minutes on each side, or until chicken is cooked through. Chicken should read at least 165 degrees on an instant read thermometer. Meanwhile, in a saucepan, melt 3 tablespoons of butter. Saute the onion until tender. Stir in the 4 tablespoons of flour and stir until well blended and bubbly. Stir in the chicken stock and cook, stirring, until thickened. Add salt and pepper, to taste. Serve the veloute sauce with the browned chicken pieces.